Have you ever seen 20,000 rubber duckies ? On Saturday, June 3, 2017, you can see 20,000 rubber ducks on the Big Lake in New Orleans City Park at 4pm. Why?… It is all for the Second Harvest Food Bank Rubber Duck Derby. Second Harvest Food Bank is leading the fight against hunger in South Louisiana by providing food access, advocacy, education, and disaster response. Second Harvest provides food to 582 partners and programs across 23 parishes. Did you know that $1 can actually provide 3 meals? For every $1 raised, Second Harvest Food Bank can provide 3 meals to those in need across South Louisiana. 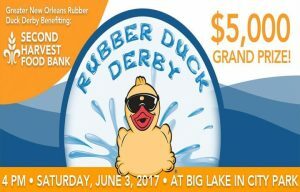 The Rubber Duck Derby invites anyone and everyone to adopt a rubber duck. One (1) duck can be adopted for $5, but if you adopt 20 ducks for $100, you get 5 additional ducks for the same price. Adopt a duck and get your duck in the race and possibly when a great prize all to provide meals for people who need them across South Louisiana.A number will be attached to each duck relating to the number on the official duck adoption entry form. Multiple duck entries on one adoption form will be assigned a separate duck number for identification. The person whose name appears on the Entry form that matches a winning duck will be awarded the corresponding prize in order of finish. Click Here For Details. The prizes are absolutely fabulous and you have 10 different prizes to win. First prize is $5000, Second prize is $1000 gift certificate to Rouses, Third prize is a Carnival Cruise for 2, Fourth prize is 2 round trip tickets on Southwest Airlines. Fifth prize is a 2 night stay at Omni Riverfront with New Orleans School of Cooking Class for 2, Six Prize is Raising Canes for a Year, Seventh Prize is Reginelli’s Pizza for a year, Eight Prize is $250 gift certificate to Rich’s Wash D’at, Ninth Prize is a Nola Motorsport Park Karting Party, and the Tenth Prize is a Baby Cakes Suite at a game.